Wow! I tried the Visible Thinking activity that I wrote about yesterday in my class this morning. We only made it through the “I know” and the first 4 steps of the “I wonder.” It was amazing – a real challenge, but one that will be a great model for the future. I can see using it again and again, because it really provided a way for the students to think about and connect with their research topics, though it is not for the faint-hearted! Lots of noise, questions, energy and interactions! It is not a lesson for a day when you want to sit behind your desk. But on Halloween, it just added some focus to their energy and excitement. The students were fine with the initial activity of finding facts in their notes that connected to their topic. They had done work like that before. While they wanted to know, “How many facts should we have?” and found it frustrating when I responded that it depended on the topic that they had chosen. For some, there were lots of facts and for others, not as many. Accepting their own ability to find and record the facts was the first step of pushing them away from Teacher-driven to Student-driven research. I want them to build on what they know and then think about what they want to investigate. It is a strategy that will become familiar, but for today, they struggled with what they saw as a the lack of clarity. None of us likes to wander in the dark, so I had sympathy for them, but still continued to push it back to them. Identifying what they know and what they want to learn about was simply one of their jobs. The next challenge began when they had to develop questions about what they were interested in learning. They wanted to be told what they should research, rather than consider for themselves what interested them. After they had written their 5 questions, they had to get them checked before writing them on Post-Its. This was where it got especially intense and wonderful at the same time. They wanted a quick OK from me, and my job was to push them to explain what was behind the questions they had, what was of interest to them. “Did Rome have slaves?” had to shift into something like, “Where did the Romans get their slaves?” or “What jobs did slaves do in Rome?” I wanted for them to move away from the “Yes” and “No” questions towards the aspects of the topic about which they were curious. For some, it might be where slaves came from; for others, it might be gender roles. Sometimes getting a student to make the necessary choices, to think through what they wanted to know, was like pulling teeth. I didn’t want to give them their questions, because I wanted them to grow from their interest, but at the same time, I had to model a good question so that they could understand the direction in which to move. Lots of thinking on my feet while making them laugh, rather than feel pressured and confused. It had to feel safe enough for them to experiment with their thinking. Once they had their questions approved, they wrote them on Post-Its and decided where they should place each questions. They had to identify one of the categories for each note. It was great, watching them wrestle with their questions, talking to each other, making decisions, changing their minds and finally deciding. It was truly Visible Thinking going on. As I wandered around after class, I realized that some of the notes were in very strange categories, for example “Were slaves allowed to marry?” was in the Geography category. Now, granted, in the mind of a 7th grader,there may be an explanation for that choice, but it was a bit unclear to me, but getting it “right” was not the point of the activity. It was about experimenting with new ideas, trying out new questions and perspectives, and working together as one messy whole. The first task for the next class will be to divide the students up and put each group with one category. They can then make sure that all of the questions connect to that topic. Then I will rotate the groups through all of the categories, having them look for questions that they find interesting and recording them. At that point, they may decide to change the focus of their research, which will be fine, or they may like what they have and stay with it. What an adventure! It was a great activity to kick off a research project with lots of student engagement and questioning! I am introducing a new research project to my 7th grade tomorrow, and I am trying a new strategy that I learned from Phillip Cummings’ blog about Visible Thinking. I want to combine the ideas of Visible Thinking, making the process of developing new ideas more apparent to my students, while sparking their imaginations about the project they are about to start. They have been studying the Roman Empire. I sent them a Google Form with 25 topics that they could choose from to begin their thinking. It had everything from slavery to gender to architecture to trade. Here is what they will be doing tomorrow, as they put some of the Visible Thinking strategies into practice. The first section is called I know…..
2. Make a Google Doc. Title it with the name of your topic and put it into your History Collection. 3. Review your handouts, looking for facts about your topic. Here are the directions for the next step: I wonder……..
1. Develop at least 5 questions about your topic. Record the questions in your Google Doc. 2. 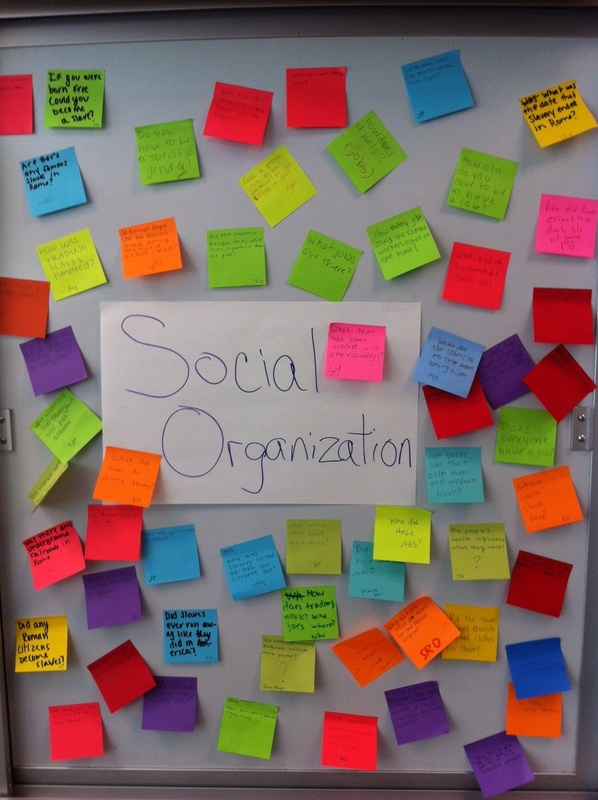 Write each question on a Post-It and hang in GRAPESI category. (GRAPESI is the acronym that we use for the different characteristics of a culture: G – Geography; R- Religion; A – Arts and Learning; P – Political Systems; E – Economics; S – Social Organization; I – Interactions with others. I want them to begin to think about the larger category that their topic fits into and to see the other topics that connect with their own.) If your question fits into more than one category, write it again. Hang it in every category into which it fits. 3. Choose the top 4 categories that are the most connected to your topic. 4. Record the 4 categories in your Doc. 5. Go to the location of each of these categories. Read all the questions on the Post-Its that are there. 6. Add at least one question that is of interest to you or connects to your topic. Record any questions that you think might help you think about your topic. 7. Rotate through at least 4 of the categories. 8. Now review all of your questions. Choose your top 5. Write those five together on your Doc. Consider what is interesting to you about the questions and about your topic? Is there overlap within your questions? 9. It is time to narrow your focus down to the top 2 questions that you have that will serve as the focus for this work. I am hoping that the process of sharing their questions and also seeing what other students are thinking and wondering will widen their own thinking. I hope that they will become more curious, so that they will be doing research that has some meaning to them that goes beyond simply getting it done and turning it in. I had my students write a reflection today on how they had learned over the course of the last unit. It had started with the activity where they were running around the back field, collecting characteristics of an empire and putting them into categories. After that, they had engaged in lots of different ways of learning and mastering the material. They drew pictures; they worked in groups; they wrote paragraphs; they made mind maps. They took a quiz about half way through the unit to see what they had memorized and how well they knew it. At that point, even with warning that they needed to know the 7 major categories and the facts connected with each, about half of the students simply did not know the material. They were intimidated by having to memorize and seemed totally terrified by the memorization process. I was surprised and concerned by the degree of their nervousness and fear. While we live in a day and age of “information overload” and “information in my pocket,” there is still a place for learning and knowing information. I wanted to empower them to learn new material. They were struggling with how to remember the categories, so I created a device, using the first letters of each category. All of a sudden, they could do it. What was interesting was that I had suggested a number of ways to memorize before I set them to the task, including doing just what I did, but it was only when I endorsed one, told them that this was a means to do it, that they bought into it and used it to learn the material. Teachers are powerful people in every classroom, even when we are trying to empower the students. What was interesting was that while the majority did it “my” way, there was a collection of girls who had already figured out a way to learn the material, and I assured them that they should definitely stick to what they had chosen. I wanted them to know that there was nothing about mine that was “right,” in comparison to theirs. Mine was simply out of the teacher’s head, but that one from them would definitely help them more. It makes me think that I need to intersperse the activities where I want them to explore and discover information with times when I simply present what is important. That way the students could be more secure in what they need to know, which might lead to more experimentation and testing on their part. I need to provide a solid foundation for their experimentation, so that they will feel safe enough to move beyond what is the norm and develop their new ways of thinking. Good lesson! As always, I am grateful to students who guide me on my journey! I had an amazing experience today. I presented at the Educational Computing Organization of Ontario’s conference via Skype. I was in my classroom, with my 8th grade students, presenting on “Collaboration: Learn it; Use it; Teach it.” While I was prepared, the experience was nothing like I expected. So here are some lessons learned, because, in a day and age of budget cuts, we may all be sharing our ideas through video presentations, rather than in person. First let me start by thanking Cal Armstrong for coordinating the experience as well as the teachers who were willing to give this kind of a presentation a try. I think that we all learned a lot from it. First of all, wifi will always be problematic! I had created a Google Presentation that I had shared with my students and with Cal Armstrong in Toronto, who was coordinating up there for me. My goal was to have my students share their thinking and responses in the sidebar, so that while the presentation was going on, my students could be sharing their experiences as well. Only, when it got to be time for the presentation, about a third of them weren’t allowed to join the session. They were panicking, because I had assigned them all jobs to do, many that included being part of the conversation. Thank Heavens for a Tech Team that is always there to support my efforts who managed to get all of the students on by the time it was time to begin. Second lesson, when you are on a small computer screen in a room, you are not always heard. I had an activity organized where the teachers, after receiving a playing card at the door, were to get into groups by number. I gave the directions three times and then asked them to find their groups. All I heard through Skype was “Hearts over here!” “Clubs in the back!” When I tried to correct them, because I wanted them in groups of 4 at this point, no one heard or responded. It wasn’t anyone’s fault but mine. I had created an activity with too much complexity for the means of interaction. If I had been in the room, I have no doubt that the directions would have been heard and understood. I could have said, “Twos over here. Threes over there,” but through the computer screen, what they expected was what happened. I should have taken more time to tell Cal ahead of time about what was going to happen, so that he could have been more of my feet on the ground. Or I could have been clearer to him on the spot, rather than trying to be heard. Lesson Learned! For me, the point of the presentation was to talk about collaboration while having the participants experience it. I am working hard when I present to move away from the “sage on the stage” which is criticized in so many presentations by people being “sages.” I want to model the kind of learning that we need to have happening in our classrooms. That is challenging when using Skype, because activities required action in the space that the presenter is not in. I think it can be done, but I need to figure out directions and preparation that have more clarity. So, with the teachers in larger groups, organized by suit, I punted. I had been planning on having more shifting and having different groups working together, so that they experienced collaboration with a variety of ways and with a variety of people, but it was clearly more than Skype would make possible. It wasn’t really a problem, just a moment of shifting. The other challenge came in using Skype effectively. While I skype all the time, I have never had to use it while focusing on the slides of a presentation. I had the Skype call in a small box on my screen, while my presentation was the main screen. I was wondering if my distance from the screen, etc. was correct, but it wasn’t the top priority. I wanted the teachers to see my class working with them, so I moved around and shifted the laptop. At the end of the session, I learned that for most of it, the people in Toronto had been seeing the top of my head. While I had figured out ahead of time where to stand and how to get shots of my students, somewhere in the transitions, I had shifted my laptop enough to cut off my head. I should have asked during the presentation, but I just didn’t of it. I had considered having two laptops, one with Skype and one with the presentation, but thought that it would work with one. Clearly a mistake! Next time, one designated for Skype and one for the presentation. Also, when working with teachers in Toronto and students sitting behind me, I should have had my students doing more. While they loved the experience of sharing with teachers in Canada, they would have liked to participate more actively. They had jobs to do, serving as notetakers, timekeepers and photographers, but they wanted to do more. They were sharing their ideas in the sidebar, but they wanted to talk to the teachers and respond to what they were hearing. I hadn’t expected that. They had been nervous and a bit intimidated when we practiced, but when they were “live,” they wanted to participate. That is definitely something to consider for the future, because they have lots of experiences they could share. So I had better figure out the challenges of digital connections and begin to make them work! Again, it was a presentation and experience that couldn’t have happened without the help of Cal and the teachers in Toronto who shared their time and their thinking! What a learning experience for me in collaboration! This past week, I tried an experiment with my 7th grade. We have been working on recognizing main ideas in the text and then finding the facts that are connected with them, important skills in history. My colleague and I decided to have them work on an activity that gave them the facts and have them build the category from the facts. We brainstormed a list of significant characteristics of an empire and added some facts that explained or were connected to the category: for example, clear boundaries was a category and mountains, strong military, oceans were some of the facts that we used. Then I got to thinking about using movement to engage the students and build a richer experience of working with the information. The weather looked wonderful. Beautiful autumn day! We enlarged each fact to 48 point font and glued them to construction paper cards, different colors for each category. All of the Clear Boundaries ones were on green paper; all of the One Leader were on purple, etc. Then we laminated them, just to make them sturdier. When the students got to class, we marched them outside to the playing fields and gave each one a few cards. We told them to scatter them all around the field and the back porch, not hidden but far apart, and to then come back. They clearly thought we might have lost our minds, but they also that this was better than sitting inside on a beautiful day, so they ran around, dropping their cards. When they were all back, we put them into groups of four and gave out their worksheets. The worksheet had 6 boxes, one for each category. The top line was labeled Purple or Green Category and then there were 5 lines, one for each of the facts. We explained that their job was to run around and collect all of the facts for each category and then, when they had them all, to figure out what that category was. They loved it! They ran around, sometimes in pairs, sometimes alone, sometimes as full teams, racing around collecting facts. It took about 30 minutes for them to collect and record all of them. By that time, they were ready to sit down and discuss what they found and what it meant. The next part was challenging for them. They wanted the category to be obvious, and they didn’t like being told that they were heading in the right direction but not there yet. This happened frequently, because they would focus on 2 or 3 of the facts and ignore the others. They wanted Clear Boundaries to simply be Geography, but as they worked at it, they got better at looking at all of the clues and building from them all. “Because we’ll remember it!” All of which were true! And I hope it works! It was a day of running and laughter, shouting and listening, wrestling and finding solutions! A wonderful way to enjoy the day and learn new skills at the same time. Having just spent two days watching my students tackle a series of high ropes challenges, I am aware of how much fear keeps us from doing what we want, and how much setting a goal can help. At each part of the course, the students had to climb up into the trees, leaving the safety of the ground and trusting in their peers to keep them safe by paying attention and holding the belay rope tightly. It was an amazing experience to watch them learn and gain confidence over the course of the two days. Initially those with experience scrambled up and easily headed across the logs and wires that were strung 40 feet in the air (my guess). It looked so easy as we watched them. Then the rest of the students began to try it. Some made it to the top of the ladder but simply couldn’t make it onto the small staples that stuck out of the tree. Some made it onto the staples but froze after two or three. Some made it to the log and could not step away from the tree, unable to walk across it, while still others surprised themselves and completed the task. The instructor kept challenging them to simply move a step or two outside of their comfort zone, that it wasn’t about completing the challenge so much as pushing themselves into a new space. Each instructor also kept reminding them that while it was scary, they were in fact completely safe. Knowing in their heads, however, that they were safe and actually being able to act on it proved to be two different things, especially the first time that the way down entailed sitting down in the harness, pushing off of the tree and letting their classmates lower them down. One fear replacing another in many cases. It was fascinating to watch the progression from fear to disappointment in themselves to determination to tackle the next challenge with more courage and focus. Every single student went further the second time up, often not to the top or to the finish, but definitely beyond their former stopping point. It became less about doing what others could do and more about pushing themselves one more step beyond where they were comfortable. They wanted to accomplish a personal goal, one that they were setting for themselves. It was great to watch the change that came over them as they ended the challenge having done what they set out to do, having taken even just one step more. On the last challenge, one of the students asked me to do it. I laughed and said “No,” for lots of reasons. “Already done it before, arthritic knees that I don’t really trust,” you name it. The instructor encouraged me to try it, but I simply shook my head, and she stopped. I did not want to do it, and as the teacher, I didn’t have to. I didn’t even have to begin the challenge if I decided not to. It all got me to thinking and as I have thought about the two days, they made me think about my classroom – no big surprise for anyone reading this blog! First, am I setting up challenges where completion is not the only goal? Can my students make it half way, learn from the experience and try another, similar challenge? School is often not like that. It is about finishing a task, doing it all and being assessed on it. I want to think about building in more levels of success. Avoiding grading each project and having students reflect on their work helps, but the part that I often miss is the repetition of the skills with slightly different challenges. I often move on too quickly, excited to try a new way of learning, rather than practicing a skill through a variety of levels. I know that I need to remember that more often. The second lesson is that I must continue to try to challenge myself as much as I challenge my students. My areas of fear are different from theirs as is my comfort zone, but if I want them to take steps out into what feels unsafe to them, I must force myself to do the same. I must build on my strengths and look for ways to move beyond them, not just for myself but for the students who spend their days in my classroom. I will guide their challenges better if I remember how hard it is to move away from being comfortable, how debilitating fear can be, and how exhilarating making it just one step further always is! If a day in my classroom could contain those elements, that would be wonderful!